Sorry, oh sorry! Debbie, Limb, SPV, everyone I am so sorry. It is true, it sounds akin to a Hollywood soundtrack and has the pomp and grandeur of a major production, but Rhapsody is simply too wimpy for serious metal fans. Drenched in keyboards and piano intermezzos, the Italians crank up the cheese factor to full fondue and compose music for the next big ancient Italian epic to hit the big screen. The melodies drench the songs and the vocals are so ever beautiful and promising I almost got myself a pedicure and treated myself to a day at the spa. It's simply too mainstream and pretentious to work. It's time to go and rent The English Patient now (I cheated, I got Dark City instead). Rhapsody, for those who have not heard the Italian band, can be described in two convergent manners. Rhapsody can be a speed metal band awash in keyboards and symphonic arrangements. The band can rightfully be considered a wimped out, washed up, synthesized and symphonized speed metal mistake. Then again, this band can be considered an orchestra introducing distorted guitar picking to its symphony. Power Of The Dragonflame is a huge album. The epic passages, long songs, majestic titles and grandiose art all coalesce to make rhapsody the epitome of pomp in all of musical Europe. Not that this means much to a metal fan, but credit is due and credit is given. As for me, it's back to metal now! 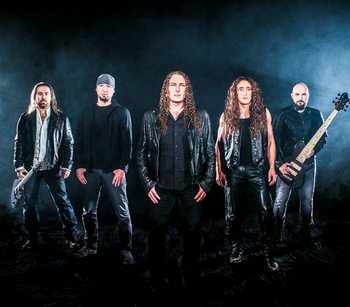 - Ali "The Metallian"
The production is obviously big and impressive, the guest even more noteworthy and fans of Rhapsody or Classically-motivated rock will absolutely love what these Italians have come up with. Even a metal fan has to be fascinated by a concept that is supposedly going to span at least five albums. Of course, the cover artwork is again impressively majestic and stirring. Having said that, this is not metal so newer fans should tread with caution. - Ali "The Metallian"
A band that relies so much on orchestral, non-metal instruments and other effects must find it difficult to perform live shows and convey their sound in a live setting. Fans of Rhapsody will definitely look forward to hear the band and their power metal sounds live but for others an epic metal release has to be exceptional to work. This one hour long, recorded on their first appearance ever in Montreal, does a decent job of it and from what one can hear the masses attending the show at the city’s Metropolis venue they may have succeeded. The emphasis of this eleven-track release is on their latest, Symphony Of Enchanted Lands - Part 2, with some lucky fans getting a bonus DVD.